Monarch Air Group provides private air charter in Fort Wayne, IN. Our clients benefit from top-notch service, unrelenting dedication to safety, wide selection of aircraft, and years of experience in chartering private jets. To obtain a free quote, please use our online quoting tool provided below, or call toll free 1-877-281-3051. Monarch Air Group provides private jet charter flights in and out of Fort Wayne, Indiana, USA. Fort Wayne is an industrial and commercial city in northeastern Indiana. With a population of about 255,824 people, Fort Wayne is the 2nd largest in Indiana and the 74th largest city in the United States. The city’s economy is mainly based on distribution, logistics, transportation, health care, business and professional services, manufacturing, financial services, leisure and hospitality. It is a home to two daily newspapers, 86 playgrounds and parks, 15 art galleries and museums, philharmonic orchestra, and children’s zoo. 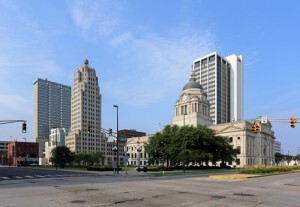 The most popular tourist attractions include Fort Wayne Museum of Art, The Embassy Theatre, Fort Wayne Children’s Zoo, Lakeside Park & Rose Garden, Allen County Public Library, Grand Wayne Convention Center, History Center, Science Central, Fort Wayne Firefighters Museum, and much more. The city is served by Fort Wayne International Airport (FWA / KFWA), which is located 20 miles from Fort Wayne. 2. AOH, Allen County, Lima, United States. 3. AXV, Neil Armstrong, Wapakoneta, United States. 4. CQA, Celina, Ohio, United States. 5. DCR, Decatur Hi-Way, Decatur, United States. 6. DFI, Memorial, Defiance, United States. 7. EKI, Municipal, Elkhart, United States. 8. FWA, Municipal/Baer Field, Fort Wayne, United States. 9. GSH, Goshen, Goshen, United States. 10. GUS, Grissom Afb, Peru, Indiana, United States. 11. HAI, Dr Haines, Three Rivers, United States. 12. IRS, Kirsch Municipal, Sturgis, United States. 13. MIE, Delaware County, Muncie, United States. 14. MZZ, Marion, Marion, United States. 15. OKK, Kokomo, Kokomo, United States. 16. PLY, Plymouth, Plymouth, United States. 17. RCR, Fulton County, Rochester, United States. 18. SMD, Smith Field, Fort Wayne, IN, United States. 1. Hilton Fort Wayne at the Grand Wayne Convention Center, 1020 S. Calhoun Street, Fort Wayne. 2. Hilton Fort Wayne at the Grand Wayne Convention Center, 1020 S. Calhoun Street, Fort Wayne.